Time fairly flies! I had hoped to publish this newsletter in January, in the lead up to Brigid of Kildare's famous arrival with the spring on 1 February. However various events have got in the way, including the coldest March day on record in Ireland: There was certainly plenty of snow, spring - perhaps not yet! Some technical issues with the website have taken time to resolve, you may have noticed that instead of a popular-posts list in the sidebar there is now a brand new Popular Posts page which is updated manually every fortnight, and also an automatically updates What's New page listing the most-recently published material here. Keep an eye on this if you want to see what what hymns, books and other resources have been added to the website lately. I've also been doing some fairly intensive work on a new project about the Sacred Heart, and hope to announce more about that in the next newsletter. 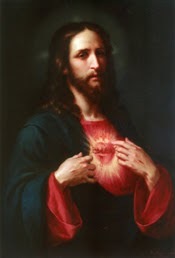 If you have any particular favourite Sacred Heart hymns that you would like researched, then this would be a an excellent time to request them. Information about this song by Virginia Vissing is now available here. Information about this song by Paul Baloche and Lenny LeBlanc is now available here. Information about this song is available here. Information about this short praise song by Dale Garrett is now available here. Someone was looking for the tonic solfa notation for this Christmas carol. Unfortunately it's been very difficult to find, not least because a version of it was was released by a group called Tonic Sol-fa in 2010! If you know where to find such notation, please leave a message in the Comments box near the bottom of the page. This was an interesting reuqest. It may refer to the orginal Latin prayer - information about this is available here. Or it may be for the hymn Soul of my Saviour, which was the first widely popular English translation of the original text - and which is set to a tune called ANIMA CHRISTI. And just to be really confusing, there are a number of other English-language hymns which have been given the title Anima Christi. If you are looking for one of the latter, please request again giving some more details of the particular hymn that you're interested in. Information about this song about Mary is available here. I'm guessing that this request was subject to some helpful auto-completion - and most likely was for Bethlehem of Noblest Cities - information about this is now available here. If that's not right, please try again. There are at least two songs with this title - one by Sebastian Temple and this one by Marty Haugen. This request is for a hymn by Ralph Wright, which contains the phrase Jacobs Ladder. I have not been able to identify such a hymn. If you have any suggestions about where it might be found, please leave a message in the Comments box near the bottom of the page. This request was for a song by Australian singer-songwriter Leo Watt. But I haven't been able to find any song by him with this title - not even on his discography. Possibly you wanted the Frank Andersen song with that title? This hymn by Carey Landry has been added to the list for future research. Information about this song by New Zealand singer-songwriter Bonnie Low. is now available here. Some information about this song is available here. If that's not the one you were looking for, please try again, giving some more details. There are several hymns which this request could be for. One is a traditional devotional song - more about it here. Another is a modern song, inspired by various traditional devotions, which was written and recorded in the Philippines - read more about it..
Information about this song by Karen Barrie is now available here. Information about this song, officially called By My Spirit, is now available here. This request is most likely for the song Land of our Birth we Pledge to Thee - which is a setting of a poem by Rudyard Kipling. Information about this song is now available here. Information about this song by Estelle While is now available here. Information about this setting of the Prayer of St Francis by Sr Breige O'Hare, is available here. Information about this song by Sebastian Temple. is now available here. This hymn by Hubert Richards has been added to the list for future research. Information about this song, officially called Mary Dearest Mother, is available here. Information about this American Christmas song is available here. Basic information about this hymn is found here. However someone who heard the song at Camp Jesus 1987 in Ireland really really wants the paino accompaniment sheet music. There don't appear to be many arrangements available - but I did locate a simple 2-hand arrangemnet in the Music Edition of in a book from Kevin Mayhew publications called Really Good Songs for Junior Church - which is also available from SheetMusic Plus. Information about this song is now available here. Information about this song by Gerrit Gustafson is now available here. However there are a number of other songs with the same title, If you are looking for one of these, please make another request with some more details about the exact song you are looking for. Information about this song by Estelle White is now available here. One option seems to be this arrangement by Walter L Pelz. I am not sure, though, if it's the correct one though, because this text has been used for a lot of hymns. If you have suggestions about other popular hymns which have these lyrics, please leave a message in the Comments box near the bottom of the page. Information about this traditional song is now available here. Information about this song by Tom Conry is now available here. Some information about this song is now available here. If you know anything more about it, please leave a message in the Comments box near the bottom of the page. This was an interesting request - because there are many, many songs with this title. Information about this one by Roc O''Connor is now available here - if you were looking for another one, please try again, this time leaving some more information about the song. Information about this Irish-language hymn is available here. Unfortunately this request only included the title, so I haven't been able to work out which particular song you are looking for. Please try again, and leave a few more details about the song you are looking for. Information about this song by Frank Andersen MSC. is now available here. This request just included the very short title. Unfortunately there are a number of songs with this title, so without some more information about it, I cannot know which one you were looking for. This request is from someone with an emergency need for the sheet music for this well-known song by Miriam Therese Winter. Unfortunately I haven't been able to find any source for this, apart from the book referred to in the song information page - and copyright law means that I cannot simply make a copy of it and share it with you. we who have laboured all the day stand most in need of you. If you have any information about a song like this, please leave a message in the Comments box at the bottom of the page. This request included the title, Symphony of Praise, and also some lyrics. Like an old violin with it's bow badly bent I lay silently gathering dust. From a pile of debris God's hand lifted me. I've found the words for Steve Green's Symphony of Praise here - but they are quite different to what was quoted. And I cannot find the quoted words in any hymn or song. If you have any suggestions where they might be from, please leave a message in the Comments box near the bottom of the page. ""Be glad my soul and glorify the Lord, my Spirit finds its joy in God, my Savior."" I haven't been able to identify this - if you have any suggestions about who it is by or what the tune is, please leave a message in the Comments box near the bottom of the page. Information about this Lenten hymn by Frank Andersen is available here. Information about this Christmas song is now available here. Some information about this children's song is availble here. This request just included the title. I haven't been able to find a hymn which is an exact match - but wondered if you were looking for You Shall Go Out with Joy? Please note that shortly after you subscribe, Feedburner will send you a verification-request message - be sure to click on the link, so your subscription is complete. Are you looking for a hymn or song? Are you searching for the words or sheet music for a particular song or hymn - especially from the last 50 or so years? 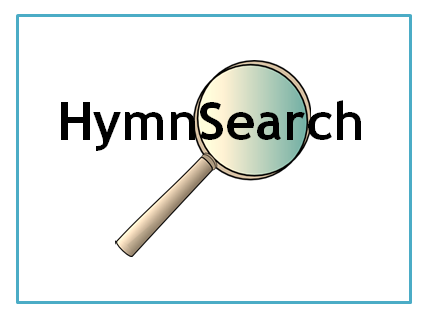 The Hymn Finder tool is your first port of call. It is a customized search tool, which lets you search for any words from the hymn - and looks for them in a set of websites that are known to contain hymns. This means that you get results which are hymns - instead of sermons and newsletters which just contain snippets, or pages about totally different topics which just happen to contain those words. If this doesn't help, then submit a request using the hymn research request tool, and it will be responded to in next month's newsletter.